The year is half-over, actually over half-over and it's time for a little self evaluation. 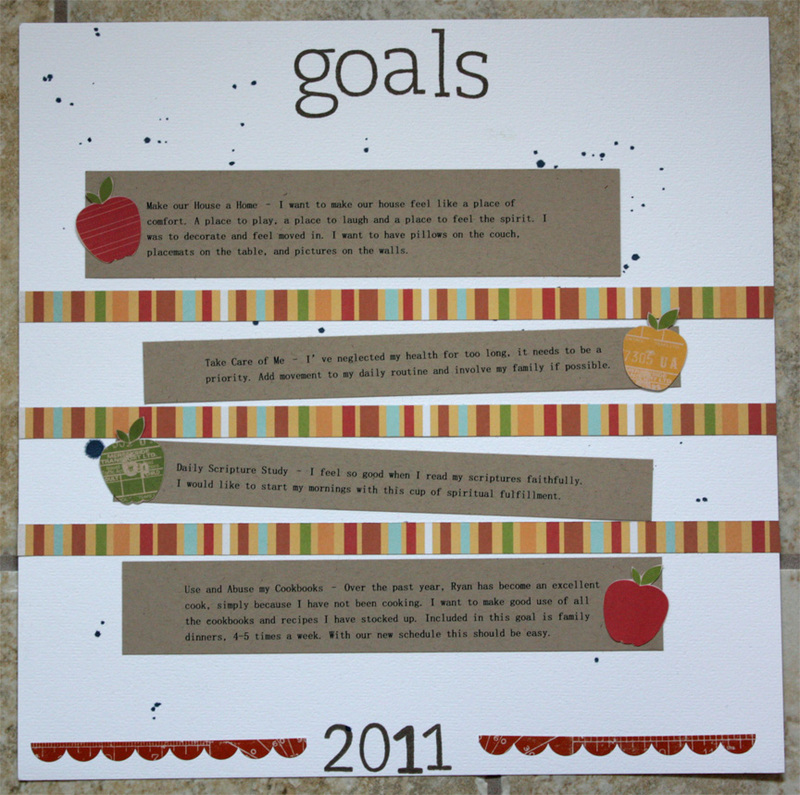 In THIS POST in December, I posted my goals for 2011. Here are the goals, with my updates. Goal 2. Take care of me. I've neglected my health for too long. It needs to be a priority. Add movement to my daily routine and involve my family if possible. This is a work in progress. I attempted this a little in Idaho, but the cold + Ryan's schedule made it difficult. I'm happy to report that since being in Utah I've become much more active. I walk 2-2.5 miles regularly, I walked in Race for the Cure in May, and I just started training for a 5/10K in October. Goal 3. Daily Scripture Study. I feel so good when I read my scriptures faithfully. I would like to start my mornings with this cup of spiritual fulfillment. Daily scripture study has always been hard for me, I'm not sure why. This probably needs the most work. I do read my scriptures more and listen to conference talks online when I'm working or scrapbooking. Needs more work. Goal 4. Use and abuse my cookbooks. Over the past year Ryan has become an excellent cook, simply because I have not been cooking. I want to make good use of all the recipes I have stocked up. Included in this goal is family dinners 4-5 times a week, with our new schedule this should be easy. Completed. Working from home has allowed me so much more freedom in cooking. I can put things in the oven or defrost things while I'm there. My signature dishes this year have been, BBQ chicken salad, homemade pizza, and baked ziti. This mid-year point is a great time for reflection for me. I love knowing that I've accomplished some things I've set out to do, and re-focus on the things I still need to work on. How are your goals going for 2011?